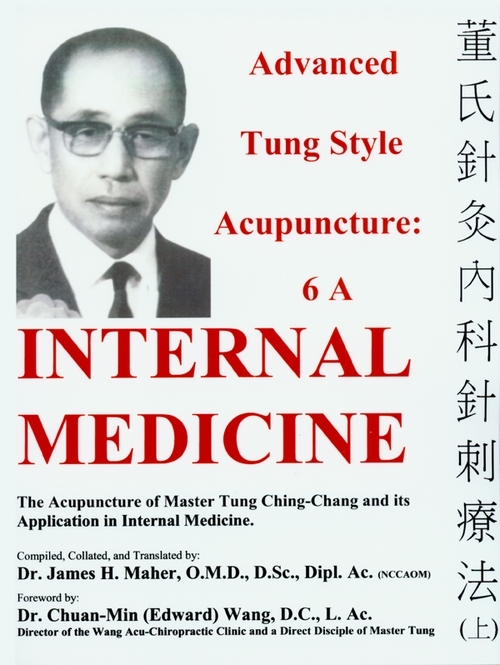 Volume 6 (in two volumes) of the ‘Advanced Tung Style Acupuncture Series’ is solely concerned with the application of Master Tung’s Acupuncture in the treatment of internal medical disorders. It is entitled ‘Advanced Tung Style Acupuncture’ because it, like previous volumes in the series, implies that the user already has a foundation in Master Tung’s Acupuncture (e.g., has taken a course such as that presented by Drs. Wei-Chieh Young, Min-Chuan Wang, Palden Carson, Robert Chu, Esther Su, Richard Tan, Miriam Lee, Susan Johnson, etc.). This text is not intended for use by the novice, but rather as a reference by those who already have a working knowledge of Master Tung’s Acupuncture. This massive, 2 volume set (Volume 6 A & Volume 6 B) contains over 980 pages of text and presents over 1,050 prescriptions culled from the Tung Acupuncture literature in the Chinese language from the translator's personal library – more than 15 different sources were referenced (several currently out of print). The author has compiled, collated, and translated all the internal medicine prescriptions proffered by the Chinese sources noted above and applied accompanying diagrams for each clinical entity to facilitate their application. Included are: author-specific point locations, needling instructions, contraindications and, when available, clinical comments, herbal suggestions, lifestyle modifications, etc. all derived from the Chinese source’s own personal clinical experiences with Master Tung’s Acupuncture. Volume 6 A of the set contains 5 chapters, 480+ pages of text, and addresses disorders of: the Cardiovascular System, the Respiratory System, the Liver, the Gallbladder, and the Blood. Volume 6 B of the set also contains 5 chapters, with 480+ pages of text, and addresses disorders of: the Gastrointestinal Tract, the Spleen, the Pancreas, the Endocrine System, and Miscellaneous Internal Medicine Disorders not found in the aforementioned chapters.